Pusher has a concept of channels and event which are fundamental to it. We can send a message to a client through a channel and have that client notify us of a read receipt by triggering an event which the sender will listen to and react accordingly. Channels provide a way of filtering data and controlling access to different streams of information, while events are the primary method of packaging messages in the Pusher system which forms the basis of all communication. 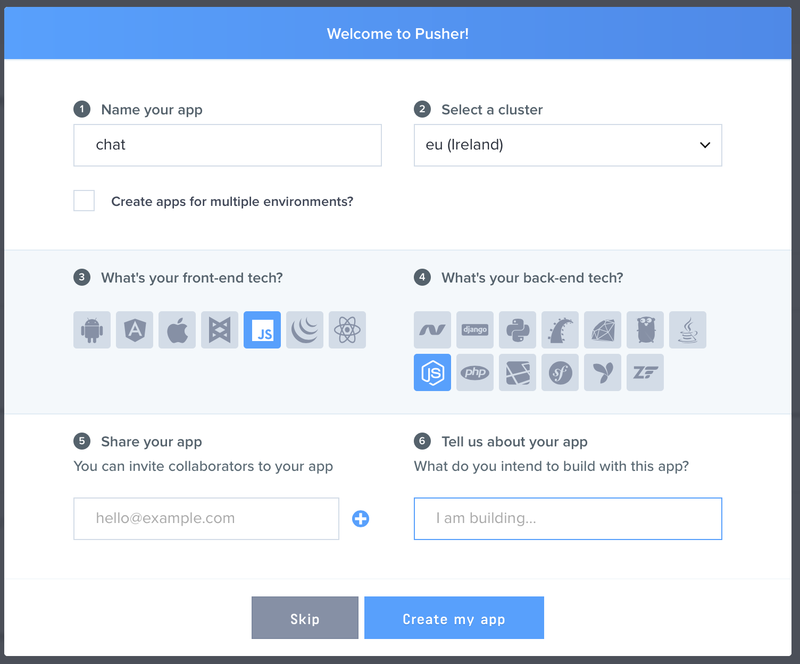 To use Pusher API we have to signup and create a Pusher app from the dashboard. We can create as many applications as we want and each one will get an application id and secret key which we'll use to initialise a Pusher instance on client or server side code. Sign Up to Pusher, or login if you already have an account. After signup we get to the dashboard and shown a screen to setup up a new pusher app. Enter a name for the application. In this case I'll call it "chat". Click Create App to create the Pusher app. Public Channel which can be subscribed to by anyone who knows the name of the channel. Private Channel which lets your server control access to the data you are broadcasting. Presence Channel which is an extension of the private channel, but forces channel subscribers to register user information when subscribing. It also enables users to know who is online. Clients needs to be authenticated to use the private and presence channels. For the sample app, we'll build the client using vanilla JS and server (for authentication) using NodeJS. Because I don't want message to go through the server, but from client to client, and I don't need to know if the user is online or away, I'll use a private channel for this demonstration, but the same technique will apply using any channel type. Client events can only be triggered in private or presence channels, and to use any of these channel types, the user/client must be authenticated, therefore the need for NodeJS back-end for authentication. Also, to use client events, they must be enabled for the application. Go to your Pusher dashboard and on the App Settings tab, select "Enable Client Event" and update. With the back-end in place, we now move on to crafting the front-end. We'll be using the template from this site with a slight modification. From the code above we first connect to Pusher by creating a Pusher object with the App_Key and cluster. These values are gotten from the Pusher dashboard. encrypted is set to false to allow it to send information on an unencrypted connection. Afterwards, we subscribe to a channel which is to be used for sending out messages. Channel names can be anything, but must be a maximum of 164 characters. Another restriction on a private channel is that it must be prefixed with private- . I will be triggering events from the client and don't want it to go through the back-end or be validated. This is just for this demo. Client events must be prefixed by client- that is why I have done so with the code above. Events with any other prefix will be rejected by the Pusher server, as will events sent to channels to which the client is not subscribed. It is important that you apply additional care when when triggering client events. Since these originate from other users, and could be subject to tampering by a malicious user of your site. client-message-added will be triggered when a user enters a new message. Once the other user gets the message, it is displayed on the page, and client-message-delivered event is triggered to notify the sender of receipt. This way we can achieve the objective of getting notified about message delivery status in our application. Run the application and see how it works.